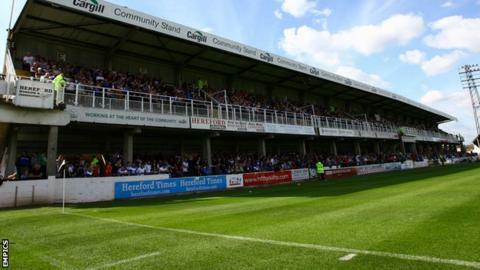 Hereford United's suspension from all football activity has been lifted by the Football Association. Chairman, and new majority shareholder, Andy Lonsdale confirmed on Thursday the FA have received the necessary documentation - including the transfer of shares in the club to Lonsdale. "I did say it was only a paperwork exercise and the ban would be lifted," said Lonsdale. "I hope people can see I am telling the truth. The FA are happy." Hereford were banned, along with their majority shareholder at the time Alan McCarthy, on Wednesday after missing a deadline to supply "further documentation" to answer questions posed by the Independent Regulatory Commission's owners' and directors' test. But now Lonsdale's major ownership of the club has been officially ratified, the Bulls, expelled from the Conference in June, can carry on their Southern League Premier Division season. However, a cloud still hangs over Hereford's future with the club due back in the Royal Courts of Justice next Monday to answer their long-standing winding-up order that has been adjourned eight times. Lonsdale has promised to invest £1m of his own money to keep the club in business and is confident the Bulls' 90-year history will not come to an end. "I believe in the club and the money should be in place by then," Lonsdale told BBC Hereford and Worcester, before confirming the finances were coming from him alone and that he was not acting on behalf of a third party. "No I'm not, 100%," he said. "It's my money." Hereford are currently 15th in the Southern League Premier Division and visit Dunstable Town on Saturday.